Gautam Gambhir went into lunch on 96 not out, in sight of his sixth Test century. Off the first ball he faced after the break, Gambhir stepped out to Tim Southee and crashed it through covers to bring up his hundred, his second of the series. There must be a bit of Virender Sehwag in Gambhir. 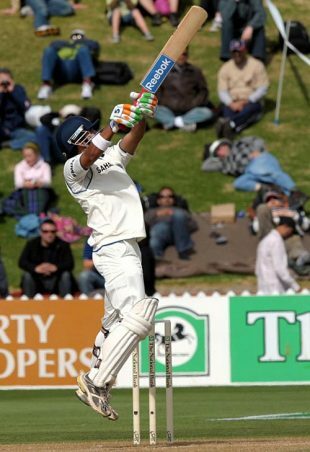 Sehwag said on television at the start of the day that Zaheer Khan, in Napier, had promised the batsmen a five-for in Wellington if they managed to draw the match. Zaheer kept his word yesterday. The upper-cut has been one of the most profitable shots in this series. Even Dravid is playing it. But what if the ball is wide and too high to reach? If you are Gambhir, you jump a foot in the air and then guide it over slips. For a six. There has been enough confusion around the end of daylight-saving in New Zealand. But like museums often do, the New Zealand Cricket Museum held on to time. They didn't pull their clock back by one hour, so according to them, the game started at noon.